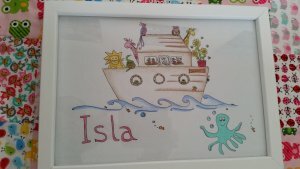 I was delighted when Charlotte chose me to review one of her bespoke children’s drawings. I’d seen some of her previous work and loved how fun they all are. 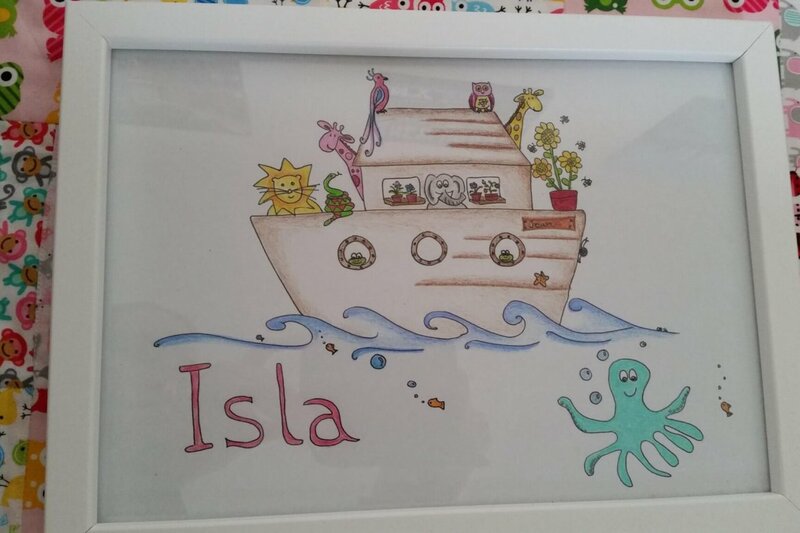 Charlotte was keen to make our picture as personal to our family as possible, so I gave her details of what we would love to be included in our picture; Isla’s name, her favourite toys (a pink giraffe and an owl). I was keen to have something gardening related as we love our garden so much, so some flowers would be ideal. I’d also asked for a Noah’s ark as Isla’s Nanny is a vicar, and we’d just bought Isla her first money-box in the shape of Noah’s ark. A lot of things to include, but Charlotte managed it! As we were on holiday when Charlotte was ready to post our picture she kindly kept hold of it until we were home to make sure it didn’t get lost. When it arrived it was well packaged, and there was no risk of it getting damaged at all. I love the thoughtful detail that has gone into the drawing. The ark has been named Jean (Isla’s middle name), and there are frogs in the port holes – everyone knows that we have a thing about frogs in this house! There are flowers on board the ark, as well as a stow-away snail – every gardener’s nemesis! I love our picture, and think Charlotte’s pictures would make wonderful Christmas presents, or gifts for a friend who has just had a baby. 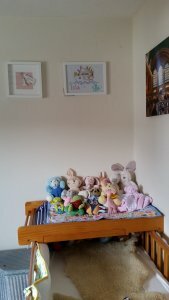 You can choose from either mounted (from £15) or framed like ours (from £25), which I think is fantastic value for a personalised picture. The frame we have allows you to either hang it on a wall, or stand it up on a sideboard. I would say my only issue with it all is that the arm of the frame which allows you to stand it up shows slightly when it’s hung on the wall. This I should think is easily rectified with a little bit of white paint to match the frame. Disclosure: I was sent this drawing free for the purpose of this review. All thoughts and opinions are my own.